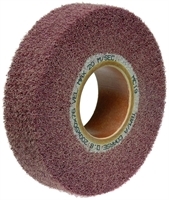 Applications: Non-woven abrasive gives consistent gentle action making these wheels ideal for putting fine finishes onto metal parts. They will clean surfcaes without gouging, remove light scratches and scuffing and produce a finish ranging from brushed to satin depending on the grade chosen. Product Notes: Non-woven abrasive is an open structured abrasive that does not easily load up and wil give a conistent finish as it wears. Avoid applying excessive pressure as this creates heat. Used normally for metal finishing, these wheels will give a long service life.